Cue the trumpets! I am pleased to present (doot dee doot) breakfast quinoa! I came across Joy’s recipe for breakfast quinoa this week in perfect timing. Quinoa for breakfast sounded satisfying and delicious, and I happened to have all the ingredients on hand: mango, milk, apple sauce, almonds and coconut. The next morning, I woke up and cooked quinoa for breakfast. 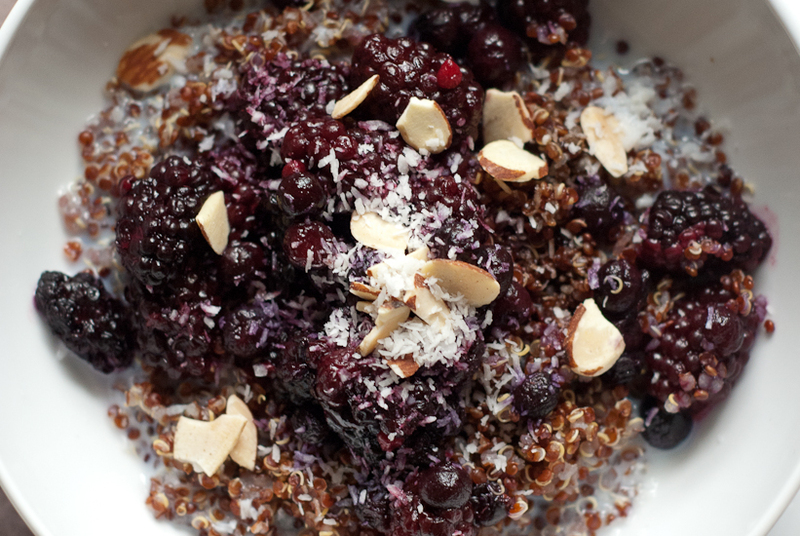 Breakfast quinoa, it turns out, is just as filling as oatmeal and as easy to make, with endless variations. 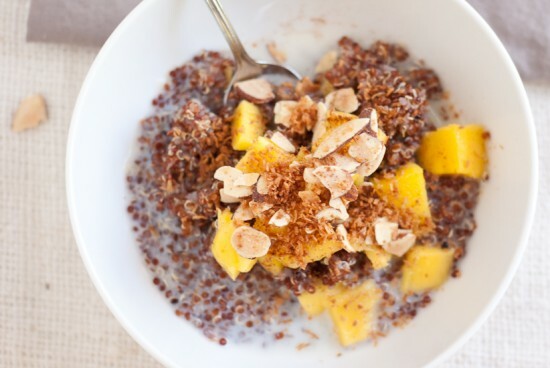 Quinoa has a nutty flavor that goes great with breakfast toppings, plus it’s a highly nutritious way to start the day. 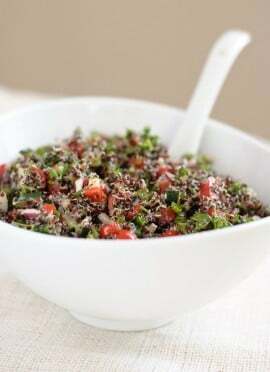 Quinoa is a complete protein that’s packed with vitamins and minerals. 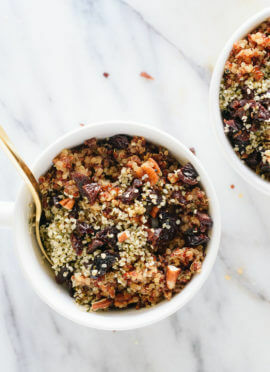 Breakfast quinoa is a perfect way to use up leftover quinoa, and you can easily make it a vegan meal if you use almond, coconut or soy milk instead of regular milk. I’m hooked! 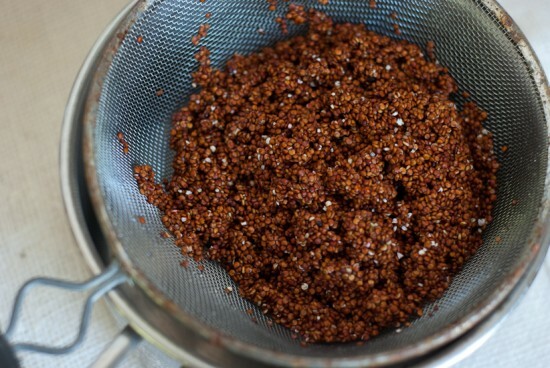 To cook quinoa, measure out one cup of grains, pour into a colandar, and rinse them under water for a few minutes. Rinsing removes the bitter saponins coating the outside of the quinoa. Then, pour the rinsed quinoa into a pot and add two cups water (you’re going for a 1:2 ratio of quinoa and water). Bring to a boil, then cover and simmer for 15 minutes. Remove from heat, let sit for a few minutes, and fluff with a fork. 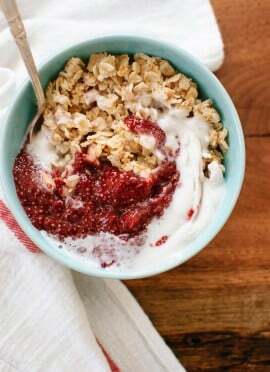 Some of the other breakfast quinoa recipes I’ve come across recommend cooking the quinoa with milk instead of water, or a combination of milk and water (e.g. this recipe on 101 Cookbooks). Emma at The Kitchn recommends cooking the quinoa with water, as usual, and then adding a cup of milk at the end and letting is cook down a bit. Both methods sound delicious, but I like using leftover quinoa for other recipes, so I cooked my quinoa with all water. I just poured milk into my bowl when I was ready to eat quinoa for breakfast. Per Joy’s recommendation, I toasted sliced almonds and unsweetened coconut in the oven. It’s an unnecessary step if you’re in a hurry. 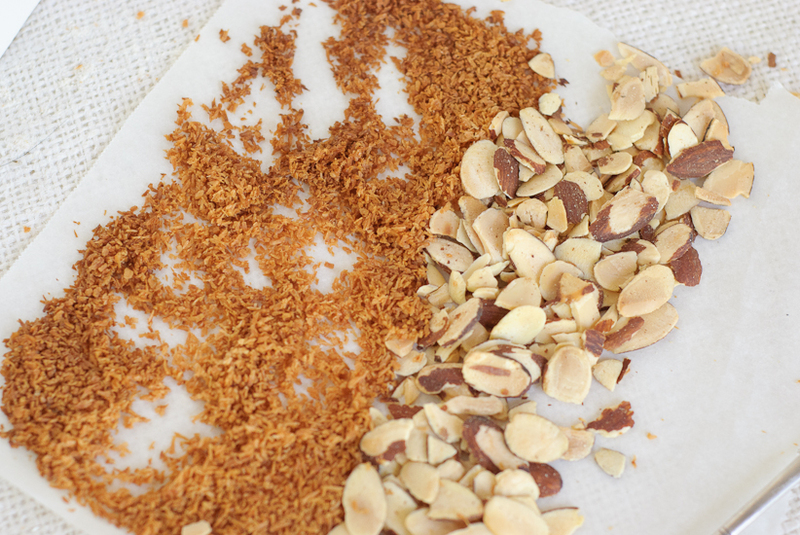 Almonds and coconut are good, toasted or not! On Tuesday, I followed Joy’s recipe. I added warm quinoa, apple sauce (no sugar added) and milk to a bowl, and topped it with fresh mango, coconut and almonds. YUM. The next day, I reheated some quinoa, added it to a bowl with some milk, and topped it with thawed frozen blackberries, blueberries, coconut, almond and a splash of balsamic vinegar. Also yum. Today, I heated quinoa, mixed it with applesauce and added milk. I diced a granny smith apple and heated in the microwave with a sliver of butter and a dash of cinnamon until the apples were soft. Then I topped the quinoa with coconut, almonds and a dash of maple syrup. 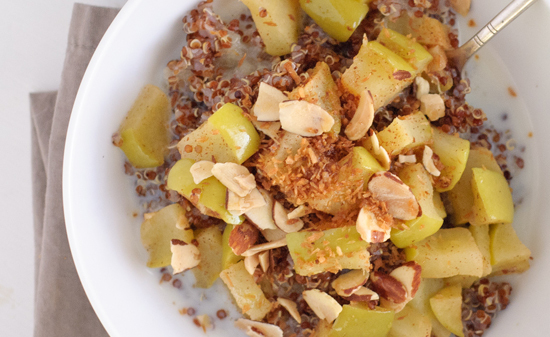 Start your day off right with breakfast quinoa—a quick, nutritious and filling meal. 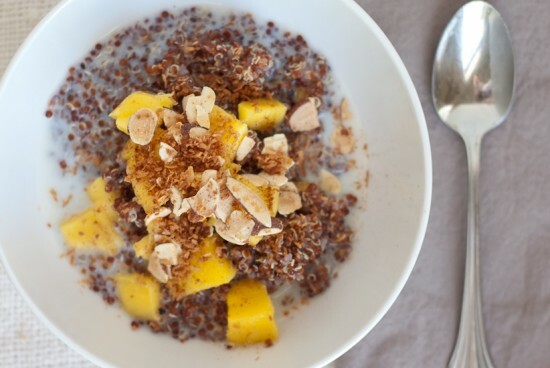 Enjoy endless variations of fruits, nuts and milks with nutty quinoa. In a bowl, combine warmed quinoa with milk. Top with fruit, add-ons and sweetener of choice. Good morning to you! I’m officially a fan of quinoa at all times of the day. How about you? so delicious & your photos are wonderful! Hee hee. When I read “Cue the trumpets”, I saw Cue the Crumpets!! Do you have things you call crumpets for breakfast over there? Must be all this food on the brain. I just made bircher muesli and have sat down to catch up on blogs whilst it’s setting into yumminess. I’m so glad an Aussie reads my blog. :) No, we don’t eat crumpets around here. I love that word, though. Maybe I’ll name my next dog Crumpet! hahaha I love the trumpets reference! I also love the brightness of these photos since this dish is for breakfast. Hope you’re enjoying more free time at home. It looks like you are! I love my newfound free time! My two weeks of funemployment end this weekend, so I’ll have to get more focused starting next week! I can’t believe I still haven’t even TRIED quinoa! I live in a really small town and I’d have to drive over an hour to get to a place that might sell it, because my small town grocery store doesn’t have it :( These all look sooo yummy! I’m favoriting this post to come back to once I get some! This looks incredible! I can’t wait to try this out… stunning photography! i love this post! stumbled upon it when i was looking for ideas to use up my bag of quinoa in my pantry! i know what ill be having for brekkie tmr morning~! had this for brekkie this morning :D its nice but i think im still trying to get used to the texture/flavour of quinoa…its def diff from my usual breakfast oatmeal! think im gonna try out your choc chip banana cookie this weekend! :) thanks for all the lovely recipes! What kind of quinoa have you tried? I just assumed all colors of quinoa taste the same, but I recently tried the white kind and wasn’t impressed. It seems like the red kind (pictured) has a more nutty flavor, which lends itself well to breakfast foods. I really like throwing some warm quinoa on salad, too. Have you tried that? haha guess what – i was just telling my mum that this morning too. yesterday we tried the white kind (which ive always used for breakfast) and this morning the black and we noticed such a difference…def more palatable hahaha. love it! know that ill be buying black/red from now on! :) will have to give the salad idea a go next time too. Thanks for the ideas. I always cook a big batch of quinoa, and then vacuum seal it 2 cups at a time. I liked everything I read except for the microwave part, there is some research on it’s effects on nutrients. Stove works just as well, and better texture. This sounds SUPER yummy! I’m always making things like this and experimenting with what will taste scrumptious with my beloved quinoa and steel cut oatmeal. Thanks for sharing :). Love this! have been experimenting w/quinoa, & so far have only had it as a side w/dinners – goes great w/grilled chicken & steak! ; ) your breakfast options sound divine — would it be possible to get nutrition info? tracking protein, fiber as well as sugar & fat, total calories. thanks! Sorry Chris, I don’t do nutritional breakdowns at this time. This is such a basic recipe that the nutrition content would vary depending on the toppings and milk chosen, too. I just stumbled across your site thanks to pintrest. So many great recipes here! Can you suggest any breakfast’s for Type 1 Diabetics? And Quinoa/Coconut/Almond or Soy milk? Hi Kurt, I’m glad you’re enjoying my recipes. I don’t feel qualified to suggest recipes for diabetes because I am not a registered dietitian, I’m sorry! I’d hate to tell you the wrong thing. Hi Kate, just wondering if you’ve ever used quinoa flakes instead??? I’ve made quinoa porridge before an loved it but I usually use rolled oats as they’re so much quicker in the morning. So I thoguht maybe I could use quinoa flakes…. Hi Kristin, great question! I have never tried quinoa flakes, no. I just googled them and learned that they may be a quick alternative for porridge. Please let us know if you give the flakes a try! Hi Kate! Thank you so much for this amazing recipe! I made it this morning with banana, vanilla coconut milk, chia seeds, and pumpkin spice. It was amazing! Seriously though, your recommendation to rinse the quinoa changed my life. Previously, my quinoa always turned out dry, and generally unappetizing. Now, however, it is fluffy and delicious as can be! Thanks! Definitely adding this to my breakfast list from now on. Your breakfast quinoa sounds terrific, Eve! Glad you are enjoying better quinoa now. This was great! Thank you! This has been my breakfast for the past 3 mornings. The toasted almonds and coconut really elevate this dish. My favorite so far is 1 mashed banana, topped with fresh blueberries, and coconut milk. I reduced the milk to a quarter cup, better still since coconut milk can be high in calories. Thanks, Jess! Your variations sounds great. Have you tried freezing this dish? I am preparing meals for sister with new baby. That’s a good question. I wish I knew for sure which recipes freeze well, but I haven’t tried freezing all of them. I think my enchiladas and lasagna would be good choices, as would my lentil soup and quinoa soup.